I was going to start this post - announcing the availability of finished shirts in PS Oxford fabric - with some of my own experiences. But how much nicer is it to use the words of a reader, as emailed to me last week? There’s nothing nicer that getting this kind of feedback, particularly when it’s something you’ve worked on so hard yourself personally. 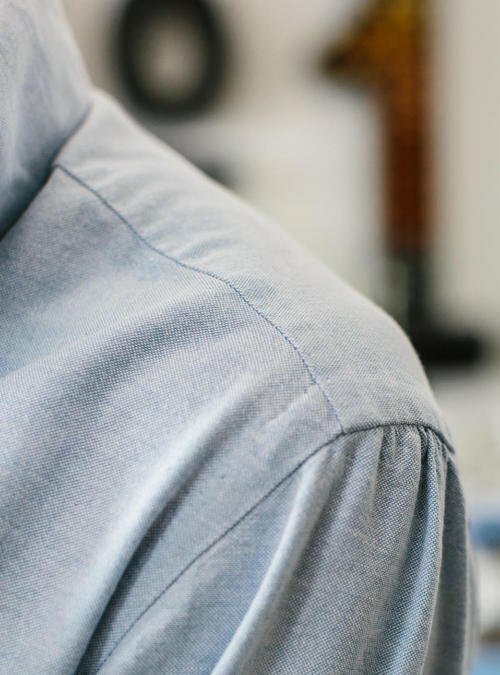 So, to clarify: the oxford shirt fabric that I developed with Canclini, and has been available just as raw fabric for the past five months, is now on the shop site as finished shirts. As with the denim shirts, these are made by Luca Avitabile in Naples, with handwork in the collar, armhole, buttons and buttonholes. They have single-cuffs and button-down collars - with that lovely natural roll to the collar that Luca and I designed for my bespoke shirts. It means the shirt rolls around a jacket lapel when open, but also encircles a tie when buttoned, rather than lying flat on top of it. They are available in four sizes: Small, Medium, Large and Extra-Large (precise sizing and measurements on the shop page). 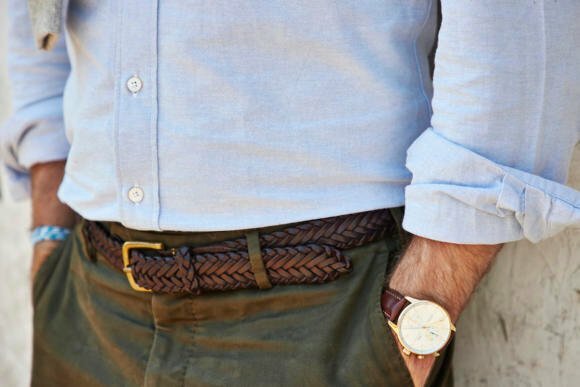 As ever, we recommend comparing these measurements to a shirt you already have to get the best idea of fit. However, there are also free returns, so you can buy two and send one back, or exchange easily. Returning to my personal experiences, I’ve found my PS Oxford shirt fills a specific gap in the wardrobe: smart enough for almost any sports jacket - from cashmere to corduroy - but also the perfect partner for jeans. It might bridge formal and casual better than any other shirt I have. I find the PS Oxford is now my default setting, going under anything except worsted suits, and providing a calm backdrop to the brightest patterns or loudest colours. It is what I put on at the weekend, with jeans or chinos, and then worry about what interesting shoes, knitwear or outerwear are going to go with it. In terms of details on the fabric itself: PS Oxford is designed as the perfect combination of rugged, traditional oxford shirts and modern desires for fineness and performance. 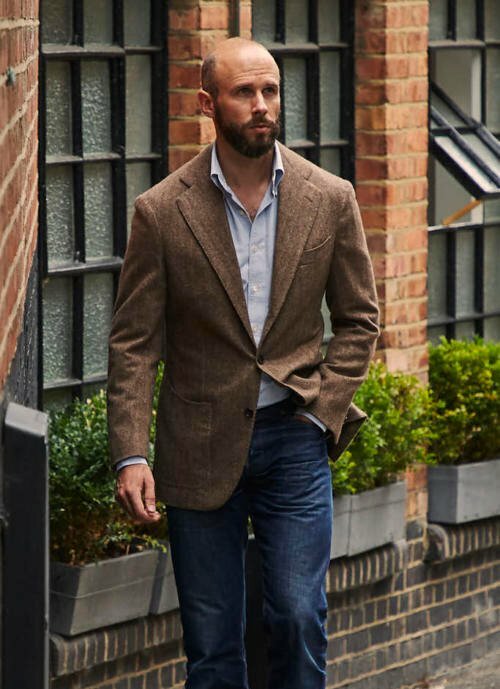 The things that set a traditional oxford shirt apart, such as originals from Brooks Brothers, are generally a heavier weight, a thicker yarn, and a subtle variation in the blue and white yarns that leads to a varied, slubby appearance. 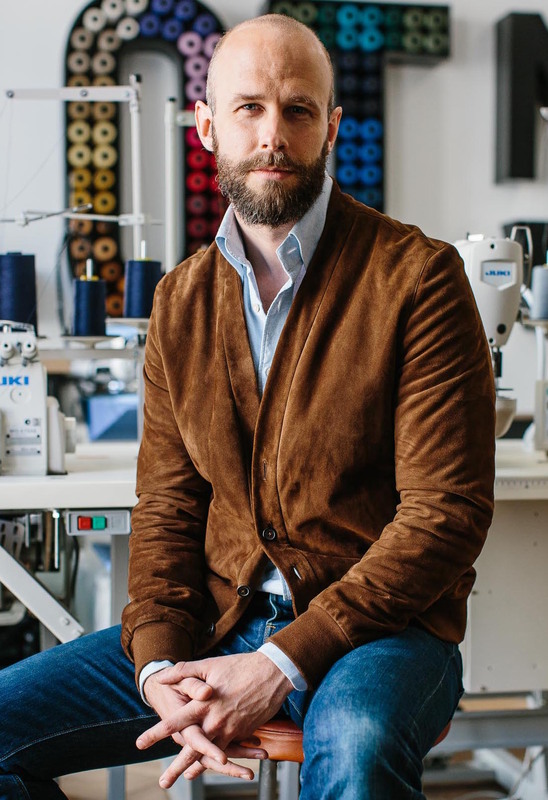 The weight of good cotton is what makes the shirt comfortable, soften with age, and feel lived-in and personal, while the thicker yarn makes it more casual. So the PS Oxford uses a thick, coarser yarn in the weft to get this effect (single-ply 10-count). But in the warp, it uses two yarns of a finer cotton (two-ply 90-count). Having two yarns in the warp means it has a similar thickness to the weft, but the higher thread count gives the fabric a nicer feeling overall. The final cloth still has that traditional texture, but avoids some of the downsides of short-staple cotton. The perfect combination, hopefully. Fortunately, that cooler weather is now here. I hope you all enjoy the shirts, and do let me know if you have any questions. You can follow the discussion on Now available: PS Oxford shirts by entering your email address in the box below. You will then receive an email every time a new comment is added. These will also contain a link to a page where you can stop the alerts, and remove all of your related data from the site. Will the cloth be available again? Yes, I think it is. You wouldn’t wear it with a business suit, but with trousers and a jacket it would be fine. 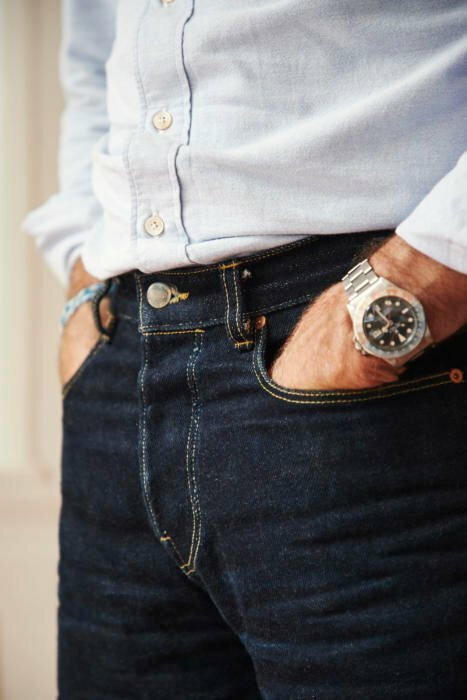 1) How would you compare the weight of the oxford to your everyday denim? ie. which would wear more comfortably in hot/humid weather? 2) When would the everyday denim rtw shirts be restocked? Do you know the measurement of the cuff for a size Large? I am 6ft 195pounds but have small wrists. Could you describe in a more detail what do the measurement numbers mean? Why two numbers in the body length? Also sleeve length looks a bit weird to me, mine is usually like 20cm larger. 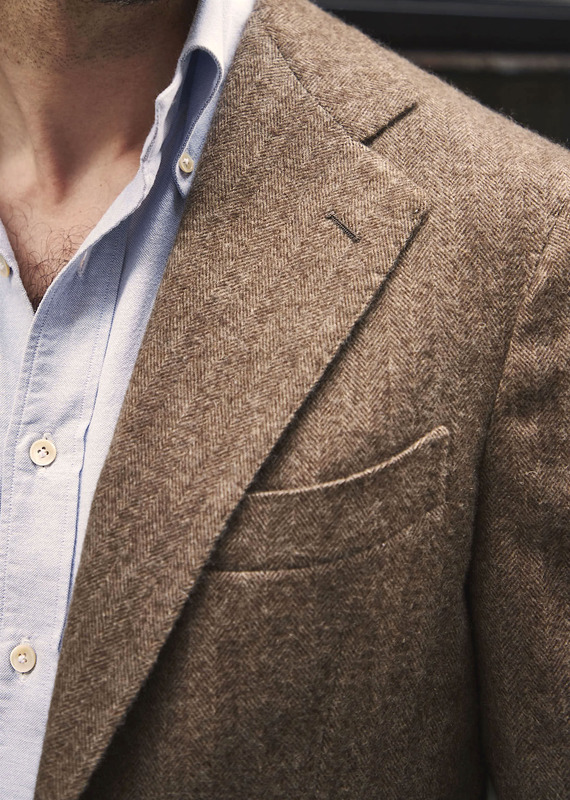 Where did you find the lovely brown herringbone jacket ( on the last picture ) ? Hello Simon, Looks like a very nice shirt. So what are the collar measurements? As I said elsewhere: I had a button down made by Luca Avitabile on my bespoke pattern, and I am more than happy with the shirt. The cloth is amazing, and getting better with each wash. Please consider adding a striped version and/or pale pink. Really. Please. A striped/bengal version would be great. I am personally not so much for pink shirts. I’m thoroughly obsessed with that suede cardigan; where is it from again? Connolly. Last season though, not sure if they still have them. Hermes also makes them, also via Seraphin. The PS clothing range is really stepping up now… any plans for a new knitwear colour that would compliment this and the denim cloth… mid grey maybe?? Now that you’re 100% Permanent Style will we see more products or existing products more consistently available? The trajectory will be the same as recent years – no change there. So one or two new things each season, and trying to keep stock up, but still keeping relatively small runs so we can still offer good pricing and avoid sales – because there’s no stock excess. Could it be worn untucked, or is it too long? Can we know what size do you wear in the pictures? What are your plans for your clothing range? Would creating your own pieces prevent you from recommending others (Mercer & Drakes spring to mind as good OCBDs). I know you view yours as superior, but it would be a real shame if we missed out on other brands (often less expensive) because you focussed on your product that you are selling. No, my plan is always to restrict my clothing to the point where I can happily also recommend and comment on the offerings of others. Given others release dozens of new products every season, and I might do a couple, hopefully that will continue to be the case. Mine will also tend to be quite restricted and quite niche. Oxford Shirt, wonderful to wear, but how could you create with out a pocket. We are all glued to our smart phones (iPhones fit breast pockets) Moral, clothing functional? Hi Simon great shirts.May I ask what’s the journal you are writing on and where can it be bought? I purchased one of your demon shirts during the last run (size large). Am I right in assuming the sizes are the same with the new oxford shirts? Just ordered a size M. My shoulders are 18.5-18.75 inches but my collar size is actually 14.75 inches. Is it possible to alter and take in the collar? I see – will see how it fits then, thanks! How long are the collar points? Thanks. Too close to everyday denim to interest me. A grey flannel would have been great or a dark navy. I do think that the PS items have to avoid duplication. Any flaneur worth his salt has got at least a couple of Oxford cottons whereas the denim was that little bit different. Thanks Jason. This Oxford is also rather different to anything people are likely to have in their wardrobe, given its thickness and single/double warp/weft mix. 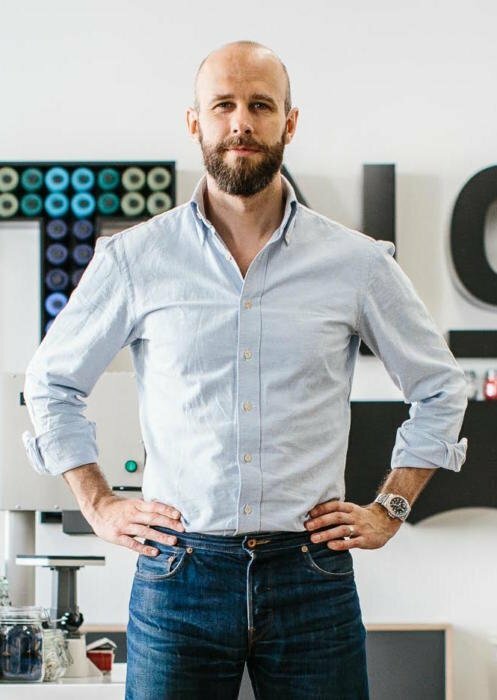 It’s also worth noting that the shirts are not driven by an aim of producing a broad range of RTW pieces, but rather developing fabrics that are generally missing in the bespoke market, and then also making RTW versions for those that don’t use a tailor. In your view, does a front placket help the collar stand up, as is sometimes claimed? Or is it purely a style feature? Simon, that was a different Jason commenting. Do you happen to know the length of the collar points for comparison? Terrific article on the sourcing, design and construction of an Oxford shirt. Very informative and well written. First what watches are you wearing in the photographs. They nicely complement the look. And secondly, not directly related but you reference in previous articles bespoke shirts made by CEGO NY and Budd London. In your opinion how do they compare? For the watches, look up the ‘My watches’ article on the site. The shirt arrived today and I must say I could not be happier. The cut and finish are great and the fabric feels it will last for years. Please consider adding more colours to the range! In the pictures above, I believe your PS oxford has pleated shoulders. Just got mine from the mail and the shoulder seems to be plain. I like the overall fit, especially the collar, but wanted to confirm with you whether or not there should be pleated shoulders, thank you. Thanks – the fabric is lovely, unlike the many cardboard-like Oxford fabrics out there. Looking forward to wearing it in. I bought one and fell in love. I wanted to buy another (XL) but they are now out of stock. I hope that you will restock soon. Just received a shirt and I’m very impressed by the quality and attention to the details. Thank you. One thing I wanted to comment about is the packaging. It came in a rather weak plastic bag. While for the UK delivery it might be fine, but it’s a questionable choice for the international orders. And I have a question, just our of curiosity. 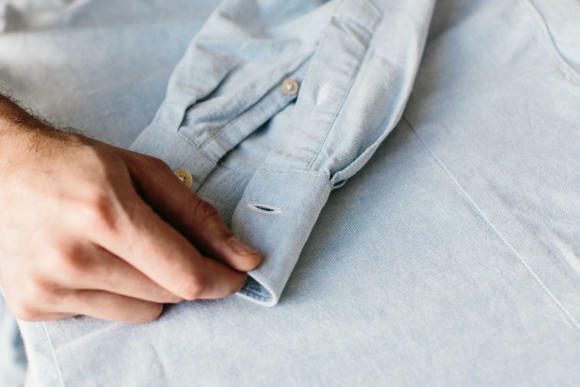 On a plank for buttons – it’s sewed to the shirt only for the lower buttons, while under the top three buttons it’s left untouched. What’s the purpose of such maneuver? Thanks Igor, noted and I’ll have a look at that. I’m not quite sure on the buttons – maybe drop me an email with a picture? After receiving this shirt, I have sent you two emails with questions about shrinkage and washing instructions and have not received a response. Could you have a check – ordered on 3 October. 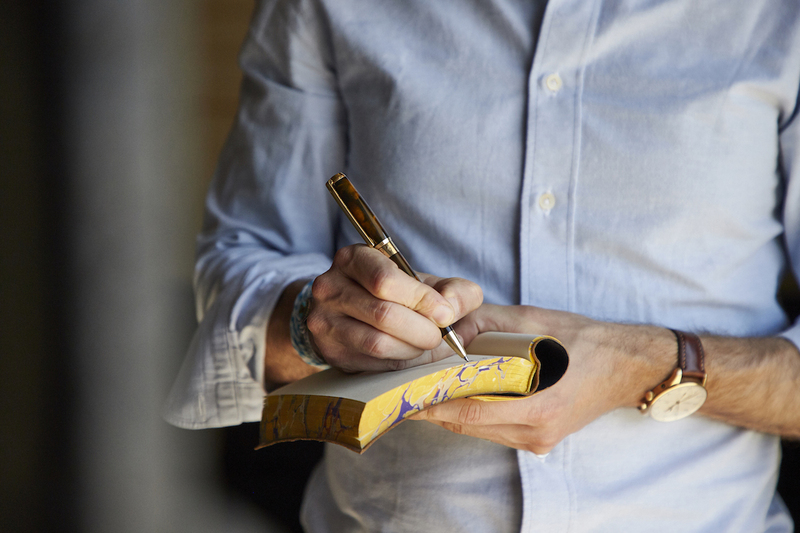 What celluloid pen are you using in that photo? Do you happen to know when size Large will be restocked?